Dr. Michael L. Lykins is a board-certified orthopaedic surgeon with expertise in total joint replacement, knee and shoulder arthroscopy, and hand surgery, with a special interest in sports medicine and robotic surgery. 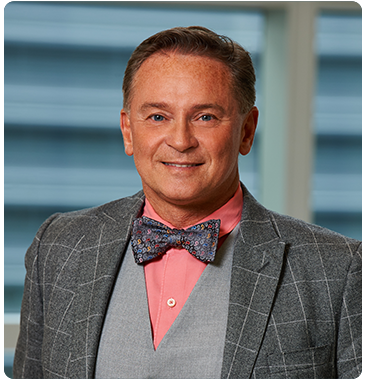 Dr. Lykins earned his medical degree from Ohio University College of Medicine in 1989. He completed his internship and residency in orthopaedics at Doctor’s Hospital of Stark County, where he was the chief surgery resident. While completing his studies, Dr. Lykins received several scholarships, honors, and awards of excellence. Dr. Lykins is active in his community. He has been in Stark County for 25 years, was the Washington Massillon Tigers High School team physician for 19 years, and has been with Spectrum Orthopaedics since the beginning. Dr. Lykins enjoys spending time with his family and is a recreational avid golfer. He is a faithful fan of all Cleveland sports and a die-hard Cleveland Browns fan.